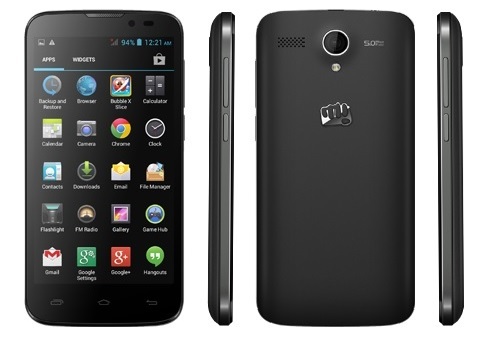 Micromax has launched a new smartphone in the sub-Rs. 10,000 range dubbed Micromax Canvas Power A96. The device is listed on Micromax’s official store at Rs. 9,900. The specs of the device are in line with the money it costs but for the huge 4000 mAh battery. The Canvas Power A96 features a 5-inch FWVGA (854×480) TFT display, a Quad-Core Mediatek MTK 6582M processor clocked at 1.3 GHz coupled with 512 MB of RAM. There’s 4GB of internal memory out of which a meagre 1.14 GB is available for the user but a microSD slot is present for expanding the memory upto 32 gigs. A 5 MP camera with an LED flash graces the back which can capture 720p video, On the front, there’s a 0.3 MP (VGA) camera. The connectivity is well covered as you would expect from a modern smartphone with 3G connectivity in tow along with dual-SIM capabilities, Bluetooth 3.0, Wi-Fi, and GPS. Android 4.2.2 Jelly Bean runs the show and a huge 4000 mAh battery makes sure the device doesn’t run out of juice. Micromax claims talk time of 13.5 hours and a standby time of 450 hours although the real life number will differ but we are quite sure the battery life will be impressive considering the light specs of the device. We are finally seeing a good trend starting among Indian smartphone makers of putting huge batteries in their smartphones. We first came across the Xolo Q3000 which offered a 4000 mAh battery although the device is a high end one with a 5.7-inch display and now the Canvas Power A96. So, anyone here wanting a budget smartphone with a great battery life, Canvas Power A96 is the way to go. 3G connectivity, dual-SIM capabilities, Bluetooth 3.0, Wi-Fi, and GPS.